My aunt who worked in Walt Disney World security has been a topic on the Gazette from time to time. 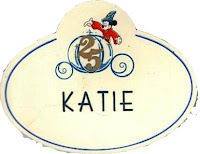 As time passes, I seem to inherit more and more of her belongings that came from Walt Disney World, postcards, recognition pins (most still in their wrappers), buttons, badges, frames, and the occasional medallion. I am of the firm belief that these treasures have taken up residence among my collection because my family knows I will cherish and care for them appropriately, a role a value and take on with the deepest respect for what it means to my family. While organizing and reorganizing the pieces of this collection, as I am prone to do, I often think of how much joy I could bring to the readers of the Main Street Gazette by sharing pieces they may not have ever heard of, or have very rarely seen. It is difficult balances the aches of going through these items while at the same time wishing to share the passion we all share. Today though, I thought I would contribute the medallion from the 100 Years of Magic. 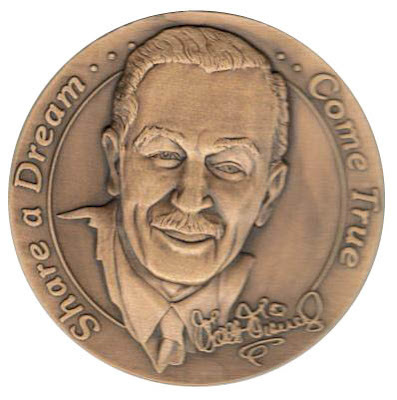 This celebration, honoring what would have been the 100th year of Walt Disney’s life, took place in 2001. 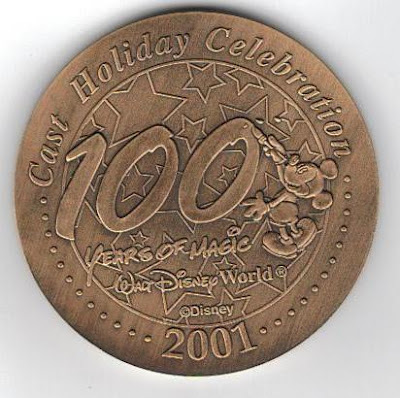 The cast medallion, which is much larger and heavier than most of the coinage issued by Disney, was presented to Cast Members as a holiday offering. Wow! What a fantastic piece of Disneyana - truly something to cherish if you ask me. I know it must be difficult, as you say, balancing the aches of going through the collection with the idea that we, your readers, love to see this stuff. Thank you immensely for what you do because they are some truly cool pieces. Love this medallion! !